Anti-hunters are not averse to believing their own propaganda, but the claim that the recent general election result swung away from Theresa May in favour of Jeremy Corbyn because of foxhunting really is a classic case of self-delusion. Ignore Brexit, national security, the NHS and blatant uncosted bribes to the young and naive, apparently just one method of managing the fox population – something that affects fewer than 99% of the public – somehow rose to the top of the list of issues that affected how the country voted. Never mind that when it comes to issues influencing voting intentions, only a handful of people raise hunting as a reason (a recent ORB poll showed that 8 out of 2038 people interviewed mentioned hunting). Even the media, as well as every politician who mentioned it, couldn’t get it right; it was not a “vote on bringing back foxhunting” – it was a vote on the future of the Hunting Act, which means an opportunity to see how effective this law has been in improving wild animal welfare…or not. I t might be argued that a letter which appeared in the Daily Telegraph signed by 26 veterinarians may have had a bearing on a relatively small number of people. It stated that repeal of the Hunting Act would be wrong for a variety of reasons, but closer examination of their arguments reveal far more of an old anti-hunting prejudiced position than a scientifically-based view. The first questionable point made was, “Studies suggest that since the introduction of the Hunting Act, fox populations in Britain have remained roughly stable” No reference was given. This is puzzling because the British Trust for Ornithology (BTO) has just released results of a 2017 survey which found that the fox population had dropped by 34%. Either the BTO finding is correct or the anti hunting vets’ view is correct – it cannot be both. At the very least, the BTO has based its results on work undertaken, while these anti-hunting vets appear to have no evidence to back up their statement. Secondly, that well-worn phrase from the Burns Report is quoted, “hunting with dogs has serious welfare implications for quarry animals”, conveniently ignoring the accompanying statement, “None of the legal methods of fox control is without difficulty from an animal welfare perspective. Both snaring and shooting can have serious adverse welfare implications.” Lord Burns and the members of his committee of inquiry have said on a number of occasions that their findings cannot be taken as showing hunting with dogs to be cruel and more recently Lord Bonomy, when asked to examine foxhunting in Scotland, reported that the use of a full pack of hounds was necessary to allow fox control to be effective. It’s a pity these “veterinary professionals who are committed to upholding the highest possible standards for animal welfare” don’t appear to be too concerned about the methods that have filled the vacuum in the absence of hunting. Thirdly, the veterinarians suggest that hunting hounds are spreading bovine TB, a view that is refuted by Dr Lewis Thomas of the Veterinary Association for Wildlife Management, “The proposal by Ian McGill that hounds infected with bovine TB running around the countryside might be spreading the disease is clearly self-serving nonsense. Even supposing they were, which is highly improbable, the proposal demonstrates a profound ignorance of how bovine TB transmits between animals (and humans).” According to the Animal and Plant Health Agency (APHA), there is no evidence of dogs spreading bovine TB as they are regarded as ‘dead-end hosts’. Finally, for scientists to use the results of selectively-worded public opinion polls as a basis for continuation of a law that has had very little examination as to its effect on wildlife, is shameful. I would hope that the wider veterinary profession will look more closely at what is happening in this post hunting ban period and, importantly, take into account those BTO fox population figures. 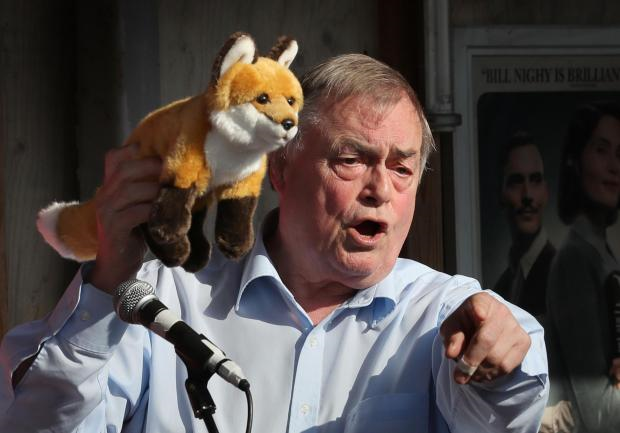 At the other end of the campaigning spectrum, maybe the sight of John Prescott holding up a toy fox and claiming, “Freddie the fox is now safe” will be enough to convince you that the hunting ban means foxes are now living in some sort of vulpine utopia. Or you might be the type of person who doesn’t see the need to bother with scientific evidence at all and instead is convinced by a crowd of adults prancing around like rejects from a children’s TV show. 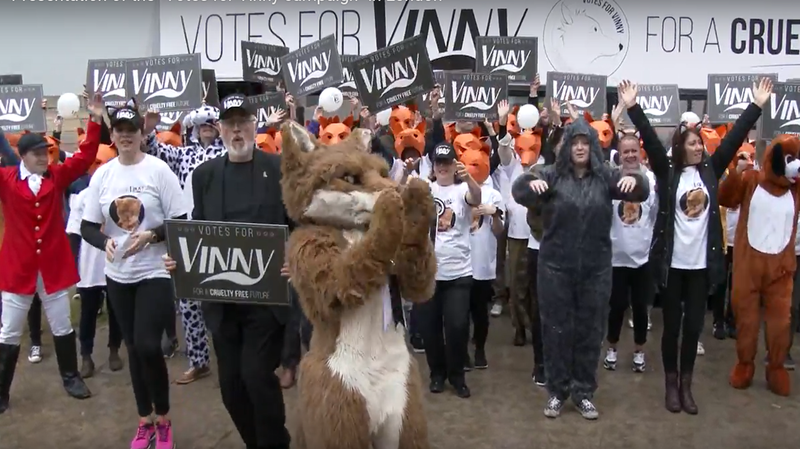 If so, then the League Against Cruel Sports’ “Votes for Vinny” bus tour is for you, though I suspect film of this campaign stunt will leave most normal people speechless. The very different ways in which the anti-hunting argument is put; one making pseudo-scientific statements, another hijacking the issue for a pathetic class war and the other…well, quite frankly it’s difficult to find the right words. Surely a serious debate about conservation, wildlife management and animal welfare deserves better.